Obviously, car makers' examination of how self-driving cars interact with other cars on the move has been necessary, but another important leg in that self-driving journey involves examining how self driving cars will interact with pedestrians. 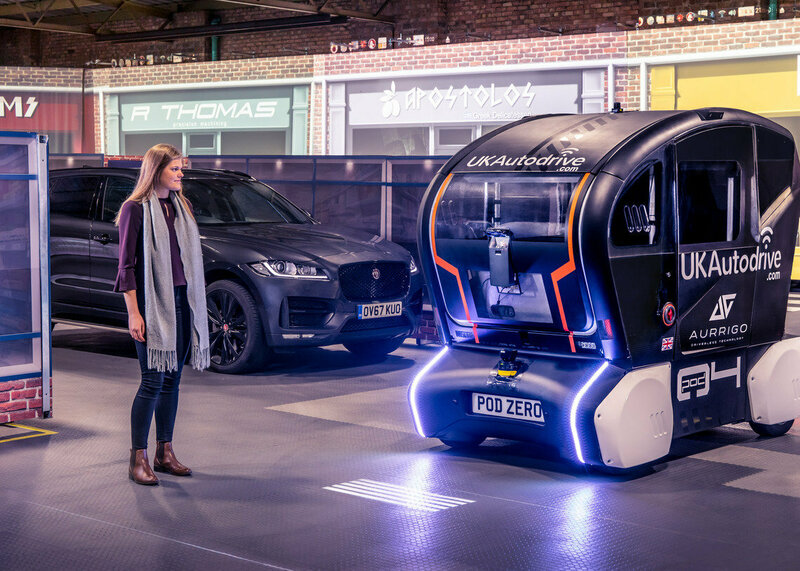 Research of that nature— how the self-driving cars will interact with people in the future—is alive and well at Jaguar Land Rover. Good timing. From 2020, new JLR vehicles will offer the option of electrification. JLR said it intends to introduce a portfolio of electrified products across their model range. By "electrification," they include fully electric, plug-in hybrid and mild hybrid vehicles. A little pod painted "UK Autodrive" is a mark of support for walkers hoping they don't misjudge where the little self-driver wants to go next. "UK Autodrive" was launched to support the introduction of self-driving vehicles into the UK; the effort unites technology and automotive businesses, local authorities and academic institutions. This is a three-year UK trial of autonomous and connected vehicle technologies. Reports on Thursday turned the spotlight on this lighting system to help pedestrians. 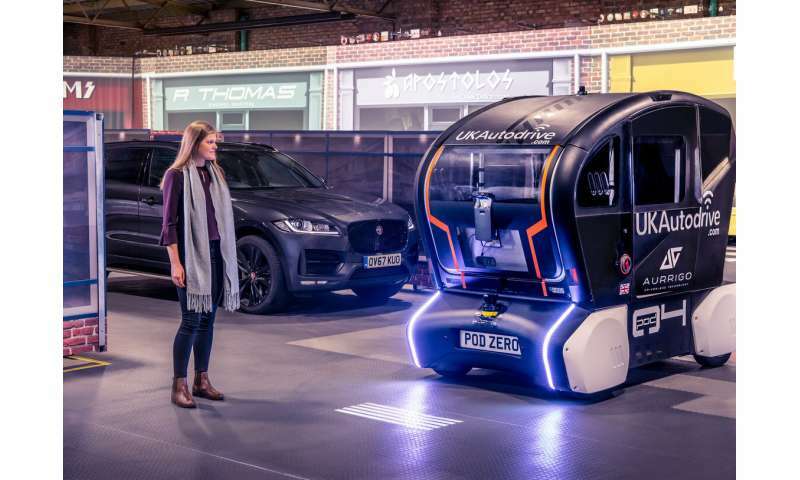 JLR future mobility research manager Pete Bennett said: "The trials are about understanding how much information a self-driving vehicle should share with a pedestrian to gain their trust." How it works: The system projects the car's trajectory, so pedestrians know what it will do next. The system projects images onto the road ahead. That way, a pedestrian is informed by visual marks the direction of the car's travel. The JLR team worked out the language of the projections in visual terms, as a series of lines or bars with adjustable spacing. Reports said this was all about "a series of projections onto the road" to show the future intentions of the vehicle. Examples—stopping and turning left or right. So, with those lines or bars with adjustable spacing, what happens is "the gaps shorten as the pod is preparing to brake before fully compressing at a stop," said the news release. If the pod moves off and accelerates, spacing between the lines extends. If the car is to take a turn, the bars fan out left or right to indicate the direction of travel. The system involves a language that is easily intuitive. Jon Fingas in Engadget: "You'll know if it's safe to cross the road without having to carefully watch a car's actions." 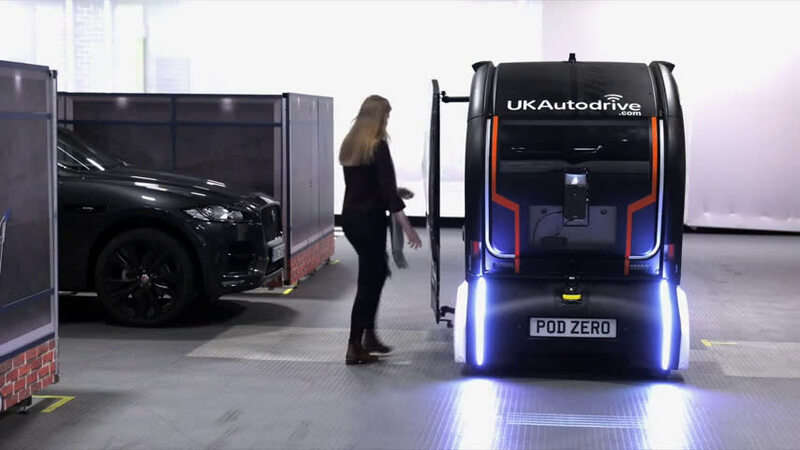 The testing was at Coventry, and the projections were tested on autonomous pods developed by Aurrigo, which is the autonomous vehicle division of RDM Group based in Coventry. The JLR news release said that engineers recorded "the trust levels reported by pedestrians both with and without projections." In the bigger picture, it will be interesting to see if concepts such as this one can instill confidence in people skittish about the very idea of seeing self-driving cars out and about. Fingas posed interesting questions for the system to be useful. "How well would it work in daylight or inclement weather?" He said if does pan out, it could go a long way to improve trust "for a public that's still wary about letting AI drive."